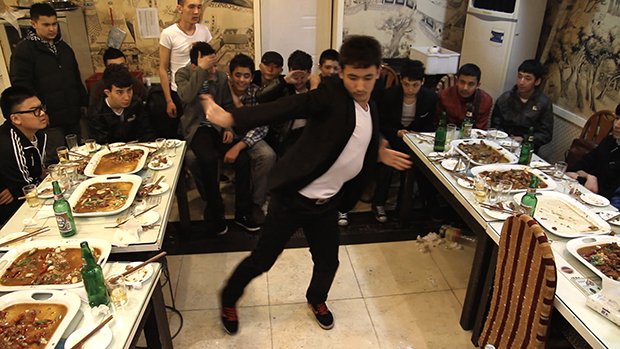 A member of the X1 crew dances at a hip hip party in a local restaurant in Urumqi, Xinjiang’s capital, 2010. Watch The Silk Road of Pop on Vimeo On Demand. Most coverage of Xinjiang focuses on the tensions between Han and Uighur in the region, especially since the 2009 Urumqi riots. The Silk Road of Pop, a new documentary about Uighur music directed by Sameer Farooq, is a timely portrait of the rich contemporary culture of China’s westernmost reaches, and the need to look beyond the commonly presented view of Xinjiang as a “troubled” or “restive” area. Though the film provides ample social and political context, it is primarily a showcase for the vitality and diversity of the music being made by young Uighur musicians in Xinjiang. The Silk Road of Pop is an exciting journey through the hip hop, rap, and heavy metal scenes, exploring both the performers’ perspectives and that of their fans—followers such as Ay, a young Uighur girl. The film subtly uses a close look at the music scene to examine myriad conflicts and questions facing Uighur youth today. In the fast-changing cities of Xinjiang, ideas about gender, ethnic identity, and the role of tradition are being renegotiated. Our team visited Xinjiang for the first time about six years ago on a break from working on our last film, I Want to Grow Old in China. We had a very close friend in Beijing who is Han Chinese, and his family lives in Xinjiang, and we were invited to go back home with him. We were immediately struck by the vast differences in Xinjiang as compared to other places in China. One afternoon, we popped into one of the many CD stores in Ghulja, our friend’s hometown, and ended up spending the entire afternoon speaking to the two sisters who owned the shop. They enthusiastically played CD after CD of local Uighur music and we were suddenly pulled into the robust and diverse music scene. After that experience, we started to notice the unusual amount of music stores in the city, and we began to question why music was produced in such a large proportion in the area. How does the music scene work in Xinjiang? Do bands tour other cities? Is their aim to get signed to a record label? It was our impression that the music scene functioned quite differently than the traditional record label/tour model. Some of the musicians we met did aspire to go to Beijing to try to get more exposure there. Some, like Six City, would travel around the country and participate in battles that were organized among the rap community. Others would jump entirely over China and form international links, collaborations with people interested in Uighur music. What was common among all of the musicians we spoke with was a shared struggle to make a livelihood through their music. It was very difficult to get the rest of China to know or understand what was going on in terms of new music production in Xinjiang. 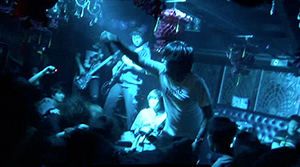 There was an enormous initiative on the part of many groups to organize showcases on their own, bringing together a number of bands to hold a concert. Usually these shows would take place in the afternoon, and draw thousands of young people from both the Uighur and Han communities. The bands playing would also straddle many cultural groups. It was very encouraging to see that the audiences were mixed. This was also due to the fact that the bands on the bill were from a variety of different groups. But this also largely depends on the show. Though Urumqi is portrayed as the center of the Uighur music industry, Kashgar is important, too. Did you visit other cities in Xinjiang and meet musicians there? Over the years of making this film we did visit several cities around Xinjiang, but it seemed as though the center of the young, popular music scene was in Urumqi, and so it became our focus. Like in many countries, young artists gravitate toward the largest city in the area to find a community of like-minded people, and this was no exception. Kashgar was also featured in our film because it is the heartland of the Uighur people and where their population is the largest. We felt as though it was a necessary counterbalance, rather than showing only Urumqi. It was also the place of Ay’s work, and her apprehension in going back showed her struggle between feeling more freedom in Urumqi, while feeling stifled by a more traditional lifestyle in Kashgar. Before I watched the film, I had no idea about Uighur rock, yet there’s footage in the film of Ekhmetjan, a Uighur rock star from the 1990s. What is the history of the hip hop and metal scenes in Urumqi and Kashgar? As far as we could tell, the hip hop scene in Xinjiang is relatively young. Many people cite a hip hop group/dance crew called DSP as being one of the first. They played a huge role in spreading rap, hip hop, and breakdancing from Xinjiang by competing in a lot of “battles” around the country. Six City, who we feature in the film, is also one of the first rap/hip hop crews and has managed to survive as a group the longest. They are still very active and are gaining increased popularity both within the small underground scene, but also among certain commercial interests. We went to an event sponsored by the soft drink Sprite where they were headlining, and they were also in a Sprite commercial on TV! Adil, a heavy metal band, in concert in Urumqi, 2010. I’m unsure of the history of the rock and metal scene. Obvious pioneers include Ekhmetjan and Askar [a.k.a. Grey Wolf]. Adil, the lead singer of Karhan and Laji Dang, referred to the former very passionately. He also spoke enthusiastically about the muqam of the Dolan people, originating from the Yarkand River Valley, the Tarim River Valley, and the Lop Nur region of Xinjiang province. In their particular muqam style (the melodic formulas used to guide composition and improvisation in Uighur music), he felt an affinity to the spirit of rock and metal, which he drew inspiration from for his own music. The film presents both traditional and contemporary styles of Uighur music, yet makes it clear that musicians playing different kinds of music don’t oppose each other. Were you surprised to find a metal band and a hip hop crew being so respectful of the twelve muqam? We were not completely surprised that almost all of the bands did mention the muqam in one way or another. It is a strong, uniquely Uighur cultural form that many of the musicians grew up listening to. How it has been integrated into their music is where the complexities begin. Many of the young people we were working with had the aim of integrating elements of the muqam into their more modern musical forms. What often resulted was that a sample was taken from the traditional form and placed into their song. In other ways, the reverence many of the musicians had for the muqam ended simply at that, and the traditional form was left untouched and respected from afar. Another aspect to this we saw was that older generations of Uighurs questioned these younger musicians, referencing the muqam and pressuring them to uphold this musical tradition rather than going in the direction of foreign music. While the current Uighur music scene seems mindful of tradition, it also embraces many other musical influences. Can you say something about its links with music and musicians from outside Xinjiang? We were really struck by the number of external musical influences the musicians we worked with folded into their own styles, and the ease with which they did so. They seemed to have such a hunger and curiosity for a diverse range of influences, and had a talent for connecting with different styles through their music. Influences were wide and varied from American jazz and hip hop, rap from Uzbekistan, Turkish and Indian pop, Flamenco. Their influences were extremely wide and far-reaching. This is not entirely surprising as the Uighurs have historically lived along the Silk Road, one of the original currents of globalization and cultural exchange. In the film, the famous tambur player Mahmut Mehmet talks of how when he listens to the muqam he remembers his grandfather, and his grandfather’s grandfather, and which minority he’s from. Can you say something about the importance of Uighur music of all kinds at this point in time in Xinjiang? The muqam works as both a symbolic and tangible expression that reinforces a distinct Uighur identity. I think Mahmut was alluding to this: when he listens to the muqam, it not only takes him back to his childhood in a tangible sense, listening and playing the muqam with his family, but also listening to the muqam plays an important symbolic role. It is distinct to the Uighur people and its very existence, structure, themes, and lyrics reinforce the culture he is a part of. Most of the Uighur in the film speak in Chinese when they talk to the camera. Was this a deliberate decision on your or their part? How many of your interviewees were minkaohan, or Uighur educated in Chinese, rather than their mother tongue? This was not deliberate—it was the result of the fact that Mandarin Chinese was the common language between our team and the characters in our film. Our interviewees were a mixture of minkaohan and those educated in Uighur. Ay is one of the strongest characters in the film. How did she come to be involved? Ay is certainly the emotional center of the film. We met her on our first research trip to Xinjiang through a friend. Originally, we thought we would work with only musicians, but while taking stock of who we met, she was one of the most interesting people on our journey. Her sheer dynamism and curiosity drew us toward her as a main character. She was always asking a lot of questions—when we first spent time with her, she literally asked us questions for three days straight. Do you believe in love at first sight? Have you ever been to a psychiatrist? Do you like headbanging? If your boyfriend was not paying attention to you, what should you tell him? We felt as though she was a complex and curious person and it could be wonderful to put her at the center of the film. She did, in a sense, act as an example of what it means to be part of the younger generation which has been born in Xinjiang province during a very difficult time. Her questions and stories were full of all of the complexities, contradictions, and struggles that younger generations deal with in the province, but also deal with universally. Through asking so many questions, Ay also confronted us with our own biases, opinions, and points of view as foreign filmmakers in the region, and we appreciated that greatly. By having to answer to her constantly, it helped us develop a greater sharpness in making the documentary. Although this is primarily a film about Uighur music and identity, Ay’s situation is like that of many young women in other parts of China: she works in a city far from her family, with economic freedom and a different view on gender and relationships. What role do you think music plays in negotiating the challenges she faces? Like many of the young musicians, music did act as an escape from the tensions and contradictions of growing up in Xinjiang at this time. Ay is no exception. Being a young Uighur woman with a keen sense of what is going on outside of the province, music provided her with a necessary escape to imagine how her life could be and to get a break from the daily annoyances and responsibilities she had in her personal and work life. It’s often said that Han and Uighur feel a mutual hostility, but there is a moment in the film which offers quite a different take. Ay is talking about the lack of romance between Han and Uighur and her sister says, “There are no feelings at all.” Was she recognizing this as strange, and suggesting that there should be more intermarriage? No, I believe she was confirming this idea—that, for a number of reasons, it is very difficult to conceive of intermarriage. Were there any particular difficulties in filming in Xinjiang? Of course it was very difficult to film in Xinjiang in the wake of the 2009 riots. We had already committed before to making a film about using music as an arena to understand what it means to be young and Uighur in Xinjiang, but we did not imagine the context we would be working in. Do you have any other projects planned there or elsewhere in China? This is the third documentary our team has completed in China, and it seems like each time we go back, the number of interesting topics that we could focus on multiply. So yes, I imagine we will continue to explore subjects that fascinate us in the region.